Accepta’s innovative Activ-Ox Instant dosing system technology is recognised as one of the safest and most effective ways of delivering chlorine dioxide at the point-of-use in a wide range of commercial, industrial and municipal applications. 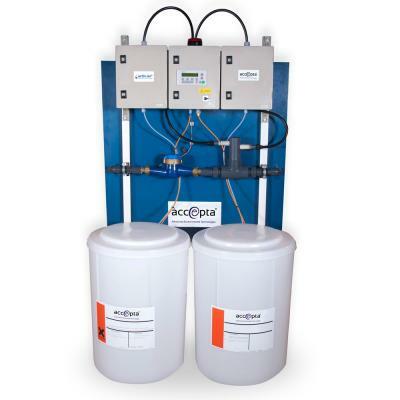 Accepta’s Activ-Ox chlorine dioxide generating system, when used with Accepta’s unique component chemicals will produce chlorine dioxide (ClO2) safely, controllably and efficiently. 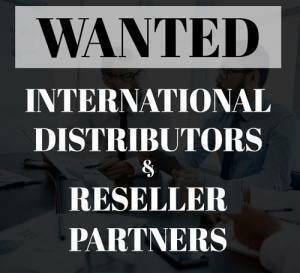 The generating system relies on the instantaneous and complete reaction between two high performance Accepta precursor chemicals developed specifically for use with the innovative system. Activ-Ox has full approval from the British Drinking Water Inspectorate (DWI) for use in potable water. Chlorine dioxide is a highly potent, fast acting bactericide and virucide at concentrations as low as 0.1 ppm. It does not form toxic by-products, is effective over a wide pH range in both hard and soft water; and does not react with most other water treatment chemicals and so leaves no residual toxicity. It will eliminate both planktonic and sessile bacteria, disinfect surfaces and rapidly destroy problematic biofilm. With minimal contact time, chlorine dioxide is highly effective against many pathogenic organisms including bacterial spores, Legionella, Tuberculosis, MRSA, VRE, Listeria, Salmonella, amoebal cysts, Giardia cysts, E. coli, Cryptosporidium and more. Importantly, chlorine dioxide also destroys biofilm so bacterial re-growth is significantly impeded. The Activ-Ox chlorine dioxide system is extremely effective at penetrating biofilms and controlling amoebae, both of which can encourage the growth of Legionella bacteria. Instantaneous activation – Activ-Ox activates instantaneously, there is no need for mixing and dilution tanks, or reaction vessels containing large volumes of strong chlorine dioxide solutions. Robust system – Activation takes place in a reaction manifold which is integral to the system pipework, so there are no fragile injection tubes containing concentrated chlorine dioxide. Reduced hazard – No chlorine dioxide gas is produced, chlorine dioxide is only ever produced in solution, and only a few millilitres of concentrated solution are held within the manifold, so there is no hazard. Eliminate under or overdosing – The dosing pumps are controlled automatically and are initiated by an impulsing water meter to prevent under or overdosing. The system will fail-safe – there is no possibility of a run-away dosage. Integral alarms – The system incorporates alarms to indicate if a pump is not pumping and if a chemical drum is empty. As a further precaution against the inadvertent mixing of the chemicals, the injection tubing is double-walled and the chemical drums are placed inside individual bunds with lids. In the event of a chemical low level float switches in the chemical supply containers will stop the dosage and initiate an alarm condition. Extremely effective against biofilms and amoebae which are major risk factors in outbreaks of Legionnaires’ disease. Activ-Ox works in a unique way, because unlike other processes for producing chlorine dioxide, Activ-Ox releases chlorine dioxide instantaneously and completely. Accepta have been able to develop a much simpler dosing system than a conventional chlorine dioxide generator or stabilised chlorine dioxide system. No gas is released, and there is no need for a reaction vessel storing dangerous concentrated mixtures, instead the chlorine dioxide is produced directly in solution in a special “Reactor Fitting” which is installed directly into the water stream to be treated. Visual alarm – for chemical drum low level warning. Drum bunds – individual outer containers with lids for 25Kg Drums/Kegs. Chemical dosing tanks with bunds and dissimilar fittings for pump transfer delivery of chemicals. Rigid suction assembly upgrade – converting normal suction foot valve and low level float switch to an adjustable rigid assembly. In-line non-return valves – to prevent syphoning when injecting into a tank or low pressure water line. Analysis equipment – Accepta drop test kit for both total oxidant and free chlorine dioxide. How are Chlorine Dioxide Levels Controlled? Chemical dosage rates are carefully controlled by a signal from a water meter in the make-up line to the system being treated. This provides precise, direct, fail-safe, proportional control over the dosage of chlorine dioxide and is inherently much simpler and safer than most chlorine dioxide generators. The Activ-Ox system can be programmed to deliver the required chlorine dioxide levels and will add it at that rate based on the water flow. 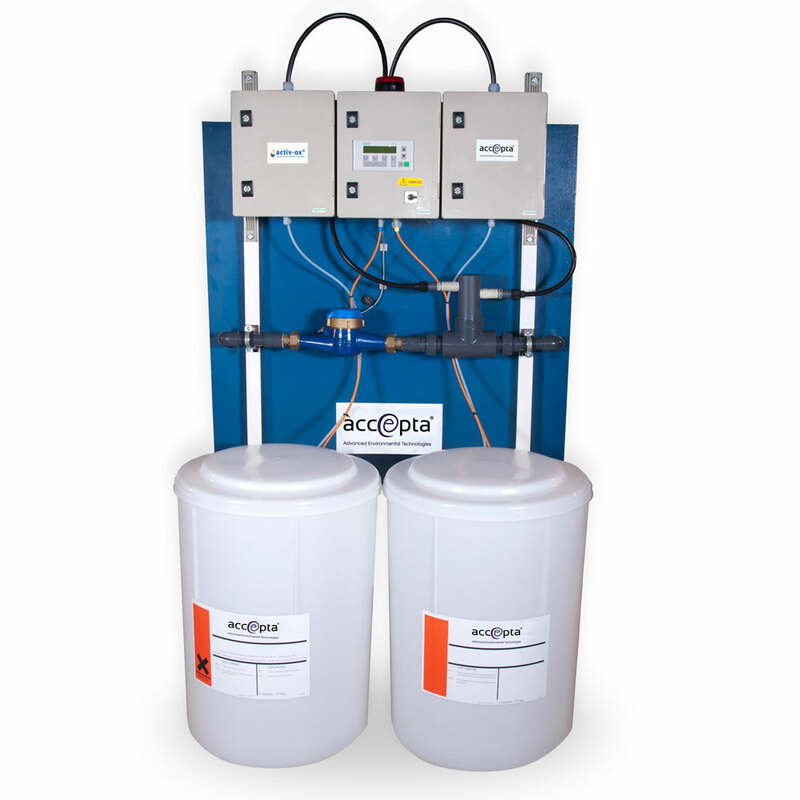 Since water supplies and water distribution systems have a chlorine dioxide demand, particularly if they have an established biofilm, each Accepta Activ-Ox system should be used in conjunction with a simple chemical test kit to enable the residual chlorine dioxide to be tested at strategic locations and the dosage levels to be adjusted to establish and maintain the required free chlorine dioxide residual throughout the system being treated.